In many cultures in Asia, paddy milled into rice is the energy-giving, life-sustaining source of food for the majority. Food security has become one of the government fundamental agendas and it is essential for the overall development. Furthermore, the government has emphasized that food security is synonymous with rice security. Many paddy fields have even made way for the more lucrative use of the land – the building of residential housing and shops. The goal of the Penang Paddy festival is to raise awareness to the hardships of paddy farmers, especially among the younger generation. At the same time, it is also to bring attention to the rapid urbanization of Seberang Perai, where many tracts of agriculture lands are being converted. On 6 August 2018 Penang State Legislative Assembly, YB Dr. Norlela, State Assembly Person for Penanti, Penang, Malaysia raise the issues of conversion paddy land to housing and commercial purposes. She is aware of the 102.18 hectares of paddy land that been converted. She hopes to save the remaining 396 hectares paddy field in Kampung Terus and Guar Jering. She promotes this awareness by Penang International Paddy Festival programme. ASEAN My World 2030 Advocate, Nadhilah Razak said on this coming August 12 we are planning to celebrate the International Youth Day by collaborate with Penang International Paddy Festival which will happened on the 11th & 12th August 2018 at Kampung Terus, Permatang Pauh, Malaysia. YB Dr. Norlela and YB Nurul Izzah will be the main organizer for this programme as they will become one of the Malaysia My World Stories for this UN SDG Action Campaign. Young women are disadvantaged compared to their male counterparts when it comes to access to funding, community trust, government tenders, and mentorship. The actions taken by the Building Bridges Foundation and its partner’s efforts in Sub-Saharan Africa can effectively address the challenges that hinder young female entrepreneurs in setting up and running their businesses. The Building Bridges Foundation in partnership with the Netherlands Ministry of Foreign Affairs and the UN SDG Action Campaign has developed a project that focuses on the economic empowerment of young female entrepreneurs in eight countries in Sub-Saharan Africa. This program has helped to equip youth entrepreneurs with the skills and tools that enabling them to grow their businesses, and empower more women and girls in their communities. “When your dream scares you, that’s when you know you are on the right track.” Sometimes I’d look at myself and think, will I really be able to be a 15-year- old designer? This is crazy! And then I realize that what I’m doing is really unique and it’s special. What has been the impact so far? 80 Humans of MY World stories were created that continue to inspire many young people around the world to do chase their dreams. 27 female youth entrepreneurs have been incubated and assisted with the skills and tools that are needed for their business to prosper and employ more young people. A book and research report were presented to heads of state, ministers, NGO leaders and other stakeholders during the Nairobi High-Level Meeting of the Global Partnership for Effective Development Cooperation. Local hubs and a network of youth entrepreneurs that cover 45 cities in eight countries in Sub-Saharan Africa (South Africa, Mozambique, Zimbabwe, Malawi, Tanzania, Rwanda, Uganda, and Kenya) have been created. The policy recommendations set out by the research component of the project aim to enhance new regulations and programs driven by multi-stakeholder cooperation in order to boost the economic activities of young women. Feeling inspired to take action? On 25th September 2017, 2nd anniversary of the SDGs we are calling for actions across the world to tell people about the global goals and tell our leaders how we are performing. We the People #Act4SDGs. On 26th and 27th August 2017, the German Government held their annual Open Days, this year under the motto “Fancy a date with democracy?”. People in Berlin had a chance to visit the German Chancellery and the Federal Ministries as well as the Press and Information Office. 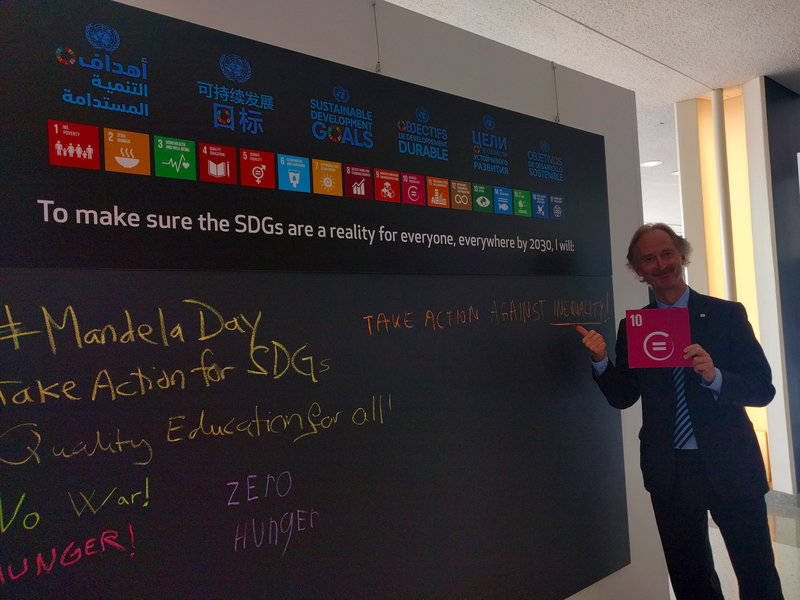 The UN SDG Action Campaign coordinated an interactive space on the SDGs at the Chancellery Gardens jointly with the German Chancellery sustainable development team and the German Council on Sustainable Development. Overall, the Open Days attracted more than 120.000 visitors, including families and young people who all had the opportunity to interact with the German federal government and administration. The Campaign team raised awareness on the Sustainable Development Goals and featured a range of innovative tools for citizen engagement. Children and adults were especially keen to try United Nations Virtual Reality and get an impression of what life is like in Liberia after Ebola, in a refugee camp in Jordan or in the Gaza strip. 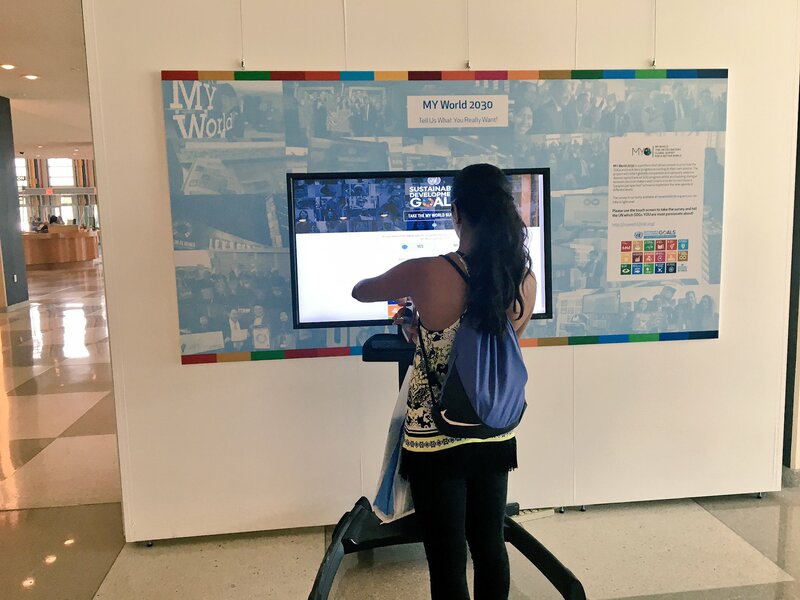 Many visitors took the opportunity to share their views on the Goals by taking the MyWorld 2030 survey and checking out the views of other citizens from around the world on the MYWorld 2015 and MyWorld 2030 data visualization platforms. The Open Days also featured the Humans of My World exhibition, which showcases personal testimonies from around the world on why the SDGs matter to the people being quoted. Read more about the Government’s Open Days 2017 on the website of the German Federal Government here (in German). Stay up to date and catch the next SDG Action Campaign Hub by following us on Twitter and Facebook. 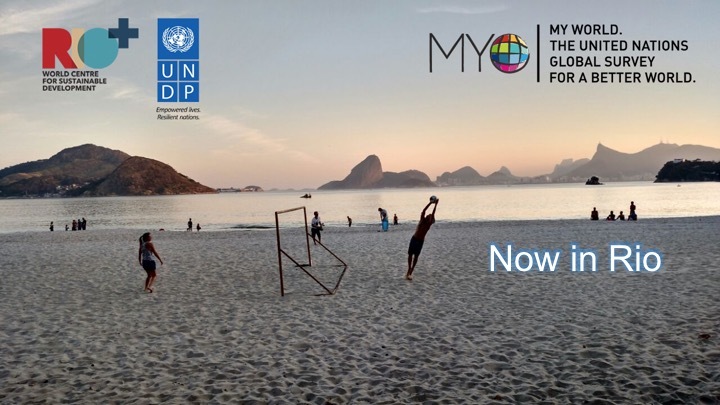 Have your Say on the SDGs taking the MYWorld2030 survey. At the end of November, a diverse group of stakeholders met in Nairobi, Kenya, to discuss critical issues at the Global Partnership for Effective Development Cooperation’s second High Level Meeting. Building upon months of grass roots organization in the lead up, Building Bridges Foundation, with partners UN SDG Action Campaign and the Netherlands Ministry of Foreign Affairs, ensured the ideas and opinions of young people had a special role at the conference. For young people, by young people, the project highlighted the entrepreneurial solutions of 80 young entrepreneurs in eight countries. Their stories were shared on the Humans of MY World blog, in blog posts, in exhibitions, and in a final report that was presented to important delegates at the HLM2. The project, Road to Nairobi 2016 has empowered young entrepreneurs across Eastern and Southern Africa to share their experiences, challenges, and ideas for local solutions to tackling the SDGs. The Building Bridges team departed South Africa in August with the mission of revealing the challenges and priorities of young entrepreneurs in eight countries in Eastern and Southern Africa. The team named a national Building Bridges Ambassador in each country who supported the local coordination on the ground. This included an open call for submissions of ongoing business solutions to addressing the SDGs in both rural and urban settings. The best were chosen to first compete to become the national winner in their country, and then were flown to Nairobi to compete in the global competition. The journey also included national youth forums with policy makers to discuss the results, where MY World 2015 results helped frame the discussions. The youth entrepreneur’s stories were profiled on the Humans of MY World photo-narrative blog along with an identification of their most important SDG. Banners were printed for an exhibition at the conference, which also included UNVR demonstrations, selfie booths, Humans of MY World voting, previews of the publications created to support the project, the actual bus which was driven across the continent, and the ability to interact with the young people involved in the project. The team also presented a draft of their report of the Humans of MY World – the storytelling project done in collaboration with the SDG Action Campaign. Mr. Seing Falu Njie, Regional Director for Africa, reinforced the UN SDG Action Campaign’s commitment to facilitating and ensuring people around the world have a means to voice their opinion through their diversity of projects, such as MY World 2030 and partnerships. The second event presented the opportunity for 3 of the young Building Bridges ambassadors and others from the region to compete in the “Get In the Ring Competition,” occurring in Africa for the first time. The event mimics a boxing match, placing two competitors in the ring for lightning elimination pitch rounds until one is crowned champion. Unfortunately, the Building Bridges representatives didn’t get the gold this time, but it was a revealing lesson about capacity building with young entrepreneurs from the region for the next project. The final report about the project will be released at the Global Festival of Ideas in March, 2017. Malawi is one of the poorest countries in the world and its economy is worsening. Malawians are struggling to earn enough money to feed their families and two years of poor harvests means that people are hungry. There’s no welfare state, so earning a living is vital for survival. To make matters worse, Malawi also faces a serious youth unemployment crisis and the highest working poverty rate in the world. According to a report of the National Statistical Office and ILO, in 2013 only 11.3% of the working population was in formal employment, and the figures for those under 35 are worse. A large part of the population is left to fend for themselves with over 54% being self-employed. But what are the lived realities? The Building Bridges Foundation team discovered on the road in Malawi that there is hope for the landlocked “Warm Heart of Africa”. The Road to Nairobi 2016 bus traveled around Malawi to meet 10 youth entrepreneurs working in a range of sectors in order to learn from their challenges and to get a better understanding of their experiences as entrepreneurs in one of the world’s most disadvantaged countries. We met youth involved in fashion, improved seeds generation, water pipe construction and much more. These entrepreneurs proved to be change makers in Malawi who are not just creating employment for themselves, but also for others despite all the challenges they face. Extensive power cuts, little education, corruption, lack of access to funding as well as scarcity of incubators and mentorship programs all hinder growth and sustainability. In the MY World survey, young Malawians expressed that education, healthcare, better job opportunities, affordable and nutritious food and access to clean water and sanitation are their top five concerns. The Malawian youth entrepreneurs we met were not only concerned with earning their own living, but especially with changing society and Malawi’s situation. “My vision is to give a future to those most in doubt and nurture them so that they do not merely become another statistic of African hardship and suffering,” said 15-year old Tawile. She expresses her feelings and hopes for the future through fashion and aims to unite Africa. Tadala T: Provide resources, information and opportunities on a merit basis, not because of who you know or what political affiliations you have. Dumisani: Change the mindset of young people and the syndrome of dependency. Ahmed: There needs to a better information system accessible everywhere where people can find all information related to entrepreneurship. Alexious: Entrepreneurship should be part of the curriculum. It should be supported so that the youth are empowered. The Road to Nairobi 2016 Project, with the support of the local World Economic Forum’s Global Shaper Hub, traveled around the greater Maputo area to meet 10 youth entrepreneurs working in a variety of sectors, in order to learn from their challenges and to get a better understanding of their lived experiences. The ventures discovered ranged from a tech startup working on information asymmetry in the labor market, to a design firm which transforms waste into materials for interior design. These individual stories are featured on the Humans of MY World photo-narrative blog. The path of an entrepreneur in Mozambique can be difficult and trying at times; a few of the entrepreneurs we met noted how the economic climate is having an impact on their businesses. Even so, some young people are choosing entrepreneurship as an alternative to looking for a job, where they are confronted by a youth unemployment rate estimated at around 80%. The young people who are resilient enough to try youth entrepreneurship need support, role models and an enabling environment. Young Mozambicans that have taken to the MY World global survey prioritize good education as one of the key areas where they hope to see positive improvement. The youth entrepreneurs we met further discussed the current education system and their experiences with it. However, they are not only focused on education in general, but see the importance of having practical skills and experience in the workplace as the key to success in their entrepreneurial journey. Lack of technological infrastructure and resources are other challenges to educational access and entrepreneurship in Mozambique. Frederico is using technology to help young unemployed Mozambicans access the job opportunities through their phones. Where gaps and challenges exist, young people in Mozambique are stepping up to empowering each other and themselves. Marlene de Souza found that young people were unable to communicate and translate their knowledge into action in the workplace. She started a company which offers training to university students on skills such as how to successfully enter the job market and how to communicate with “attitude,” so that these students can bridge the gap between the academic and labor market. Lineu: More young people need to have the courage to start for themselves. I started with nothing and almost 100% of the people didn’t believe in me. Claudio: When you register a business, you are sent from one place to another. The process will be better when everything is in one place. It should take less time and require fewer documents. Wilton: Government must create conditions for young entrepreneurs to develop businesses. Especially fiscal policy because currently, police doesn’t differentiate between being a young entrepreneur or an old entrepreneur. Sides: We need more incubators with people who have been trained to support youth entrepreneurs. Authors: Samantha Ndiwalana (Project Manager of the Building Bridges Foundation) and Annemarelle van Schayik (Research Manager of the Building Bridges Foundation). 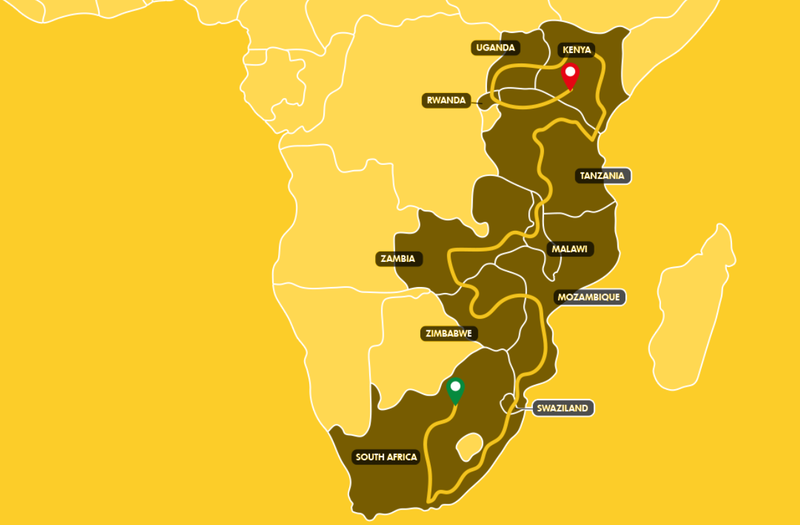 The Building Bridges Foundation has completed traveling through South Africa, its first country on the Road to Nairobi. With its mission to foster youth-led solutions at the grassroots level in order to contribute towards the effective implementation of the Sustainable Development Goals (SDGs), the team met with over a hundred youth entrepreneurs across the country. The Foundation’s seeks to learn from grassroots youth entrepreneurs to to understand their day-to-day challenges and how these entrepreneurs have thus far managed to overcome them. Samantha Ndiwalana, Building Bridges Project Manager, and Annemarelle van Schayik, Building Bridges Research Manager, report back on the team’s journey through South Africa. “African problems, need African solutions” – some South African youth have taken this approach to heart and are fighting for a better future every day. In South Africa there are more than 19 million young people between the ages of 15 and 34 (as defined by South Africa’s National Youth Policy), that is 42% of the population. Strikingly, among the 9.8 million youth in South Africa’s labour force only 6.2 million were employed and more than 3.6 million youth were unemployed in 2015, with unemployment being especially high for those residing in rural areas. However, most people cannot afford to be unemployed due to the lack of significant safety nets and the responsibility to care for their families. Today’s South African youth were born in the last years of, or just after, Apartheid. Since then regardless of race, color or gender all youth should have the same access to resources and opportunities in theory. However, the lived reality is that black South Africans struggle more than white South Africans, not necessarily solely because of race, but also because of a different upbringing and exposure from a young age. The MY World global survey led by the UN SDG Action Campaign shows that in South Africa most people want “A good education”. In the past years, thousands of youth have gone onto the streets to stop university tuition fee increases and instead are demanding free education. In a country where many black South Africans are the first of their generation to enter university, keeping up with fees and other university expenses is a challenge. Many drop out before graduating due to “financial exclusion”. Still, a future without a university diploma is seen as one of insecurity and poverty. South African youth’s priority is not only education, they are also concerned with being taught the skills that will enable them to succeed. “We don’t learn practical skills. There is no talk about running a business up till high school. How can we take care of ourselves?”, remarked one youth. Youth who drop out of university or do not continue after high school should have learned skills to create a better life for themselves than their parents had. Youth are the future and they all should be given the tools to contribute to a better future for themselves, their communities and South Africa as a whole. Entrepreneurial innovations should be encouraged from a young age. Schools play a fundamental role in this. A white-collar job is not the only path to success and wealth. As skills training goes underutilized, there are opportunities for individuals with, for example, artisan, technical, electronic or plumbing training. There are many self-employment opportunities in these fields. In fact, South Africa is in need of local entrepreneurs who can create sustainable businesses. South African youth have great potential to innovate, to change, to create solutions. Of course, being an entrepreneur is not for everyone, but those who have the passion and the drive can potentially learn the skills. Their success is not just on the individual level. It carries through their communities and their nation as they employ other youth. Youth entrepreneurs not only address issues of decent employment opportunities, but also other striking local problems. Youth are drivers of innovation. On their journey through South Africa the Building Bridges team met, among others, innovative youth who are working on hydroponic farming, an interactive, but informative game about energy and how to handle, a cheaper medical insurance solution for uninsured South Africans. Youth entrepreneurs are the future. But before changes can be made, we need to understand what the lived experiences of South African youth are and what can be done to enable them to succeed. Besides a pressing lack of business education from a young age and role models, many black youth entrepreneurs found the access to business registration lacking. We were told time after time that the decentralized government system is confusing and that the entrepreneurs wasted time being sent back and forth from office to office. Others were unemployed and had difficulty paying the needed business registration fees. Those that succeeded then found it difficult to get the startup capital needed. They were seen as risks by the banks and government funding was often unavailable for their type of business. However, besides lacking capital, many entrepreneurs also face negative feedback from their communities. Whole families depend on their income. Brothers’ tuition fees, sisters’ mobile data, and of course there needs to be food on the table. Working from 8 to 5 means a stable income and is the desired path by the wider community. All odds are against the young South African entrepreneur to succeed. 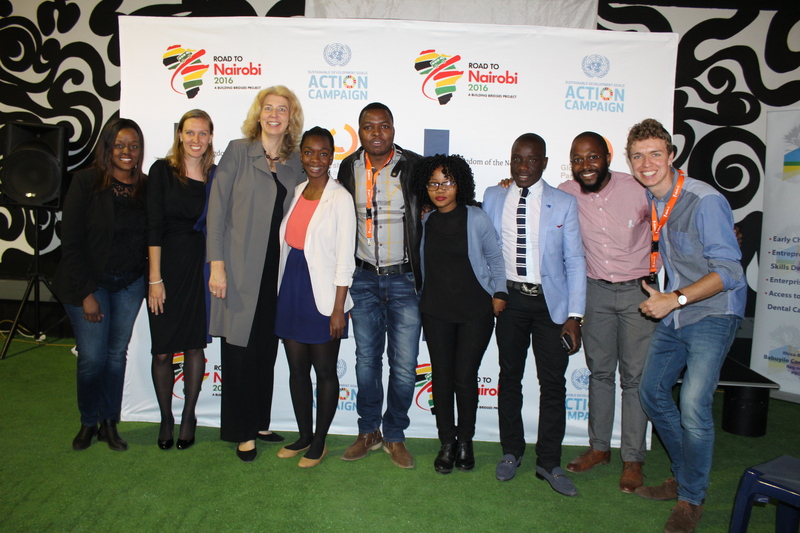 The Building Bridges Foundation’s Road to Nairobi 2016 project kicked off on International Youth Day, 12 August 2016, in Johannesburg and at the United Nations Headquarters in New York. The Building Bridges Foundation is a not-for-profit organization established in the Netherlands. The mission is to foster youth-led solutions at the grassroots level in order to contribute towards the effective implementation of the Sustainable Development Goals (SDGs). In their first project last year, the Foundation collected the opinions and priorities from young people by bike riding from Amsterdam to Cape Town in an effort to include youth voices in the development of the Sustainable Development Agenda. In this second phase, the Road to Nairobi 2016, a team of Dutch and South African youth will travel by bus from Johannesburg to Nairobi, meeting 80 inspirational and innovative youth entrepreneurs from all industries and walks of life in eight countries. In each country, these real life case studies of the challenges youth entrepreneurs face will be presented to government officials, CEOs, foreign ambassadors, representatives of the UN and the media during a youth summit in the capital. The project co-creates solutions that promote youth employment and aims to inspire African and global leaders by showcasing how young people are making a difference, and how their work can be further promoted to help achieve the SDGs by 2030. The results will be presented at the Global Partnership for Effective Development Cooperation (GPEDC) in Nairobi in December. “Young people often have the best out of the box solutions for difficult problems. So if we want a better life for unemployed young Africans, who else to ask then young African entrepreneurs.” said Dutch Minister for Foreign Trade and Development Cooperation Lilianne Ploumen. She continued, “they show that starting your own business empowers and creates jobs and income. The Road to Nairobi brings these smart youngsters together with politicians and business leaders who are eager for innovative and smart solutions. To reach the Sustainable Development Goals, young people are key.” Minister Ploumen supports the project in her role as co-chair of the GPEDC. The Project was launched in South Africa in the Diepsloot Township jointly with the Building Bridges Team and the Dutch Embassy in South Africa. Focus on youth entrepreneurs in townships and rural areas, the launch included a panel discussion, about the enabling factors for innovative entrepreneurship and the necessary steps that will allow South African entrepreneurs to benefit from increased globalization. In addition to the project’s launch in South Africa, the project was ceremoniously launched at the SDGs exhibition in the United Nations Visitors Lobby by H.E. Mr. Karel van Oosterom, the Netherlands Permanent Representative to the UN and the UN SDG Action Campaign. The Ambassador toured the exhibition, seeing the enormous influence the first phase of Building Bridges had in collecting people’s voices to support the development of the SDGs. HE van Oosterom then viewed the current platforms for action, taking the MY World 2030 Survey reading the Humans if MY World stories and experiencing UN Virtual Reality. 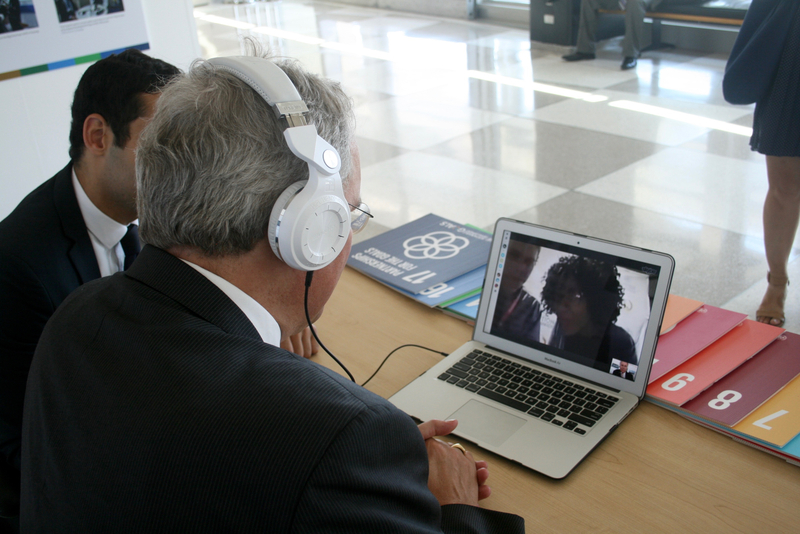 The visit concluded with a live video chat with the Building Bridges Team in South Africa, providing words of encouragement for their journey to foster youth employment on the African continent. To create real changes, the Building Bridges team together with the most inspiring youth entrepreneurs will present their data and suggest solutions at the Second High-Level Meeting of the GPEDC in Nairobi. 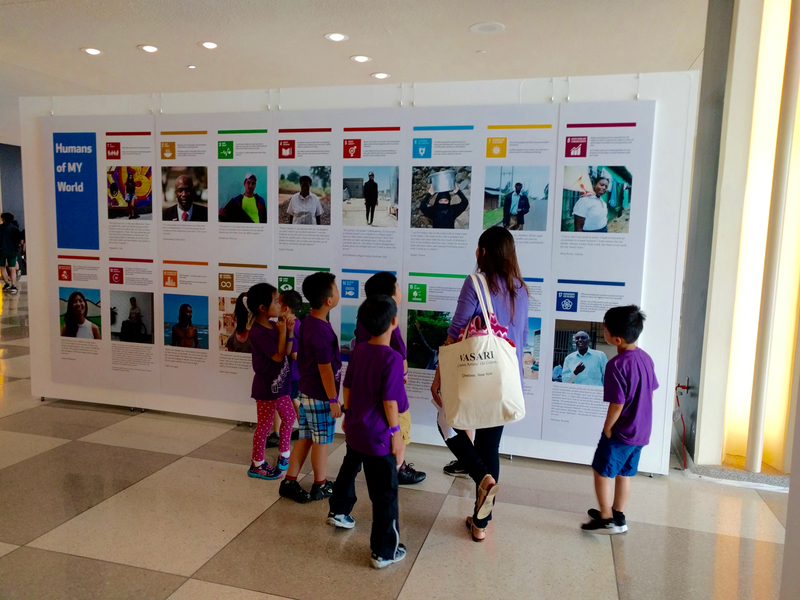 Since its launch on the 18th of July, the SDGs: A People-powered Agenda – Leave No One Behind exhibition at the United Nations Headquarters has drawn excited crowds of visitors and high-level delegations from around the world. During the High-level Political Forum on Sustainable Development (HLPF), H.E. Erna Solberg, Prime Minister of Norway and co-chair of the United Nations Secretary-General’s SDG Advocacy Group, was one of the first to visit the exhibition together with the Permanent Representative of Norway to the United Nations, Ambassador Geir O. Pedersen. 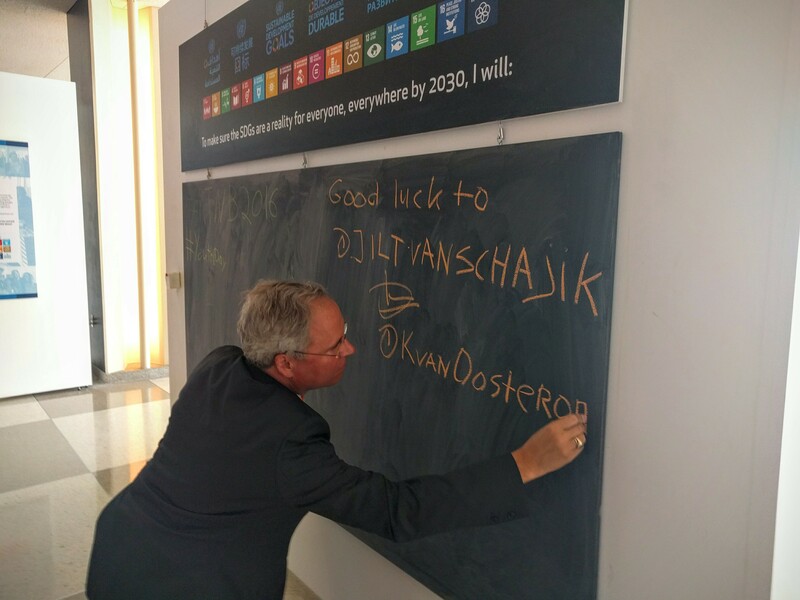 Both expressed their commitment to making the Sustainable Development Goals (SDGs) a reality for all on the exhibitions large size blackboard. H.E. Erna Solberg wrote that she will continue to advocate for “Quality Education for All”, while H.E. Geir O. Pedersen committed to “Take Action against Inequality”. The HLPF is central platform of the United Nations for the follow-up and review of the Agenda 2030 for Sustainable Development and the Sustainable Development Goals. It provided political leadership, guidance and recommendations on the 2030 Agenda’s implementation and follow-up; keep track of progress of the SDGs; spur coherent policies informed by evidence, science and country experiences; as well as addressing new and emerging issues. In addition to visiting the SDGs exhibition, H.E. 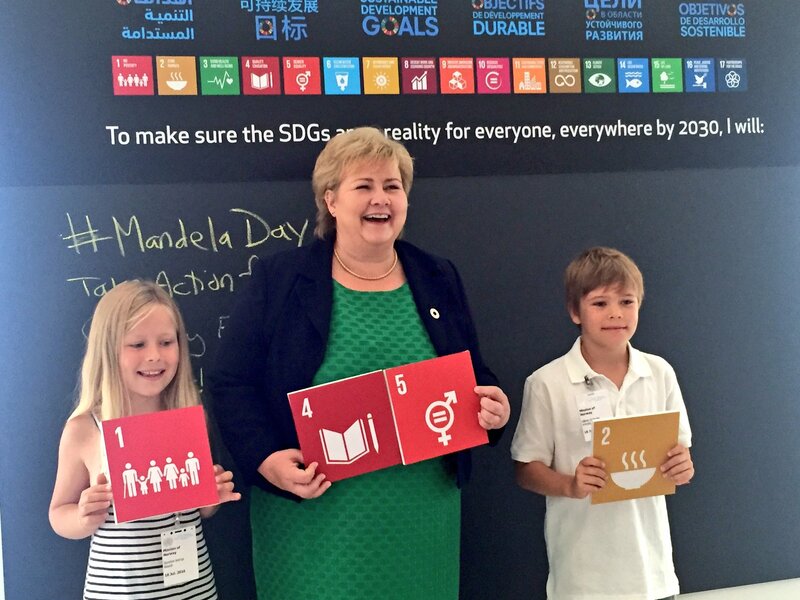 Erna Solberg delivered the opening key-note speech at the start of the Ministerial Segment of the HLPF on 18 July and presented Norway’s voluntary national reviews on its progress of delivering the Sustainable Development Goals on the 19th. Taking up the United Nations Secretary-General Ban Ki-moon’s challenge that “youth should be given a chance to take an active part in the decision-making of local, national and global levels,” members of Junior Chamber International’s (JCI) visited the SDGs exhibition during the JCI Annual Global Partnership Summit. 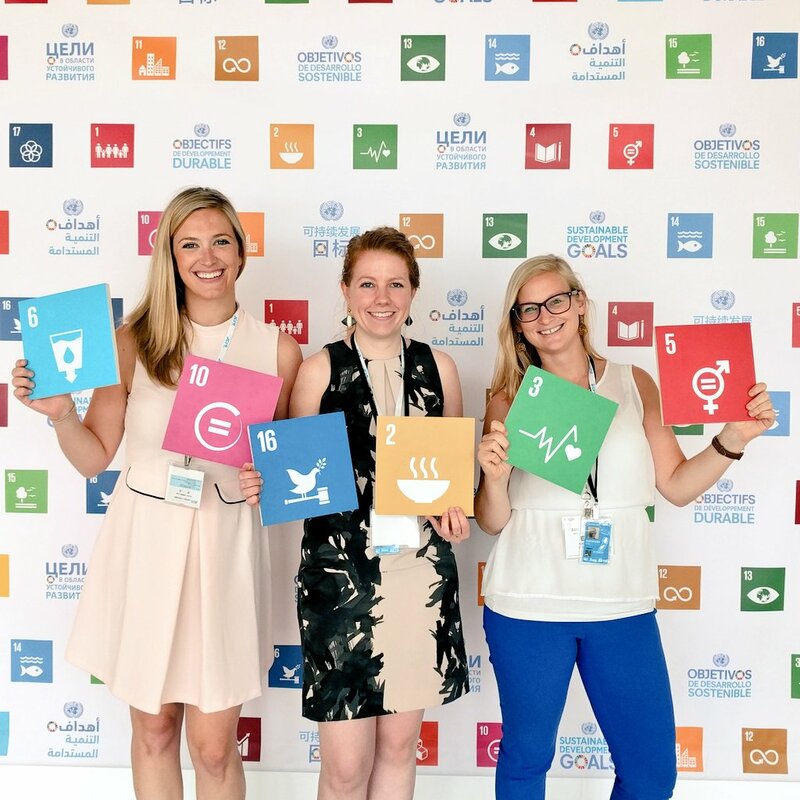 Held July 25 to 28 in New York City, the summit offered international leaders and JCI members the chance to visit the exhibition and experience its interactive selfie stations, take surveysand engage with the important challenges and opportunities that the SDGs present to youth globally. Moreover, groups of national and international students have been particularly drawn to the exhibition’s touch screens hosting the MY World 2030 Survey (www.myworld2030.org), the High Level Panel on Women’s Economic Empowerment’s special MY World 2030 Empower Women Thematic Survey (www.empowerwomen.myworld2030.org) and the United Nations Office for the Coordination of Humanitarian Affairs (OCHA) Impossible Choices humanitarian challenge (www.impossiblechoices.org). The UN Virtual Reality film series, which allows visitors to immersively experience the life of some of the world’s most vulnerable using high-tech 3D VR headsets has been a major visitor attraction since the opening of the exhibition. Visitors have been touched by the human stories of the Syrian refugee crisis, the Ebola outbreak in Liberia and the effects of conflict in the Gaza Strip in the VR films Clouds Over Sidra, Waves of Grace and My Mother’s Wing (www.unvr.org). 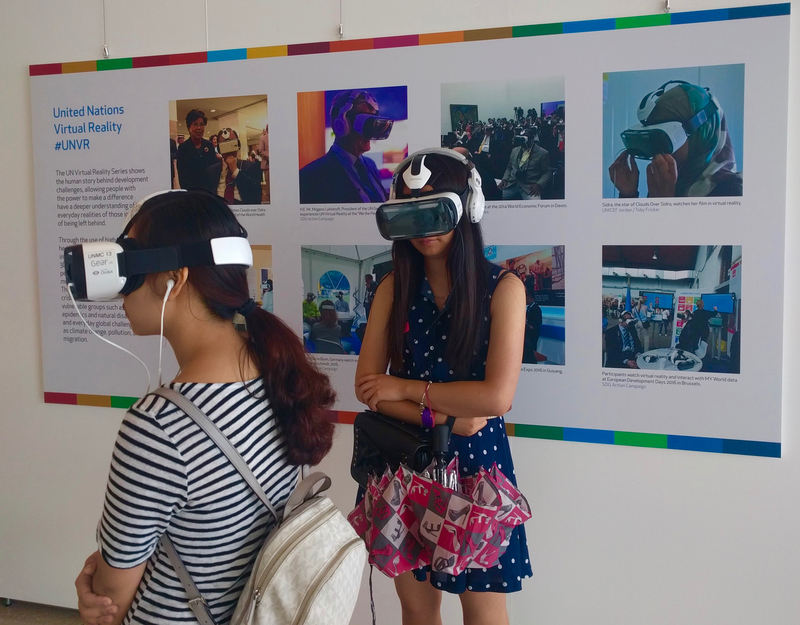 The interactive SDGs exhibition will continue to be open until 4 September 2016. All visitors must exit the building by 5:30pm. Virtual Reality screenings at the exhibition: Monday through Friday, 10am to 4pm. The entrance is at 46th Street and 1st Avenue, New York, NY 10017. Visitors without an official UN Pass will have to first obtain a guest pass at the screening station on 46th and 1st across the street from the UN. Be sure to bring a photo ID. If your delegation or mission would like to schedule a special exhibition tour, please kindly contact Kristin Gutekunst at kristin.gutekunst@undp.org (9143303774). Humans of MY World is now in Rio! Countdown to Rio with the Humans of MY World! With the arrival of the 2016 Summer Olympic Games, the world’s eyes are focused on Rio de Janeiro, the “marvelous city.” Known for its good vibes, warmth and joy, Rio de Janeiro is home to many local characters with inspiring stories to tell, whether in line at the bank, on the road or at happy-hour after work. To honor the people of Rio in the lead up to the Olympics, Roberta Thomaz, member of the RIO+ Centre team set off for the streets of Rio to capture the peoples’ energy, creativity and hope in their attempt to live more sustainably. The RIO+ World Centre for Sustainable Development, a legacy of the 2012 United Nations Conference on Sustainable Development (Rio+20), was set up to keep the commitment to sustainable development alive in both action and ideas. A partnership between the Government of Brasil and the United Nations Development Programme (UNDP) based in downtown Rio, every day they inspire and inform policies and practices that lead to greater social, environmental and economic justice in an attempt to transform the urban daily life, artistic and social of Rio’s population. Join the 10 day countdown as we share the hopes and dreams of some of the local people of Rio by following the Humans of MY World on Facebook!